The Environmental Program at Merritt College celebrated its 50th Anniversary on December 1, 2012 at the Self Reliant House on campus where 60 people gathered for a day of hiking, history and discussion about the future of both the program and the globe. Program Director Robin Freeman lauded colleagues for having begun some of the first college environmental activities in the state and nation. Accomplishments include the first ecology course at the Peralta colleges in 1962, the first dedicated student-built environmental center in 1981, the first ecological restoration certificate program in 1991 and the first Green Building Materials Conference in 1994. The celebration came two weeks after Oakland Mayor Jean Quan and San Leandro Vice Mayor Michael Gregory spoke at the Merritt Environmental Program. Last month, Merritt College environmental students joined local leaders and residents in an event organized by Friends of San Leandro Creek (FOSLC) to imagine and plan activities around the creek and the watershed. Bringing back the creek’s vitality was at the top of the agenda for the dozens of people who gathered at San Leandro City Hall to brainstorm on restoring the creek’s 6.5 mile open greenway. The creek flows from Lake Chabot in the hills to the estuary between the Oakland airport and Alameda. The goal is to make the creek cleaner and safer, and more natural and more accessible so the community can fully enjoy it. Participants described many ways to do that: Planting a tree farm and a community garden, involving San Leandro high school students, posting interpretive signs, building creek crossings and adding disability access. Several local leaders, including Oakland Mayor Jean Quan, Vice Mayor Michael Gregory and City Manager Chris Zapata of San Leandro spoke at the meeting about the history and value of watershed restoration work. Quan endorsed the group’s goals and touted how Friends of Sausal Creek, primarily through the work of hundreds of volunteers, has succeeded in returning a good portion of the creek to its native habitat. Jeanny Wang, an environmental scientist who has recorded some of the creek’s “vital statistics,” explained the importance of monitoring and improving the creek’s health. Instrumental in organizing the meeting were Freeman, Gregory and Susan Levenson of FOSLC. Each semester, students at Merritt College’s Environment Program organize meetings, field research and community work to maintain efforts to restore native fish and provide parks along the creek. Merritt classes have been using the creek as a field lab for four years. Overall, the meeting convened community members from many backgrounds passionate about improving the state of the watershed. Their ideas and commitment injected fresh energy into a long-term project that requires the input of San Leandro and Oakland neighbors to bring the creek and its environs back to life. 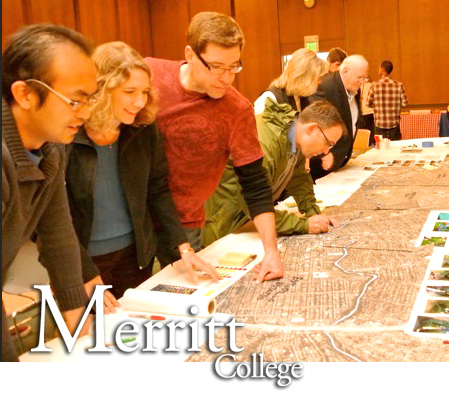 Those interested in exploring more about San Leandro Creek can enroll in “Introduction to Sustainable Urban Planning” (ENVMT 11) at Merritt College or “Tree to Sea, A Bay Area Cross-Section” (ENVMT 40). For more information, see www.ecomerritt.org or Friends of San Leandro Creek, www.fslc.org. Leanne A. Grossman contributed to this story.